Baba Rada makes her own filo pastry on a small holding near Sarajevo. She then makes delicious savoury and sweet pies (pita) with the pastry. I was lucky enough to spend some time with her and made this image of her sheep. The distinctive mountain Romanija, in Bosnia towers above. 'Baba Rada's Farm' is a limited edition collagraph, this being #2 of 3 prints, printed in bottle green on quality peach-coloured Surrey cartridge. The plate for the print was a piece of card with textured papers and thread glued on. Another gorgeous location in South Devon, Dartington Hall is a a beautiful building set in exquisite grounds in Dartington. Sitting and drawing this landscape was a real pleasure. 'Dartington Hall Grounds' is printed in a dark green on quality peach coloured 'Surrey' Cartridge. This is print #4 of 5 and the last one left for sale. At the mouth of the River Otter, Otter Head in Budleigh Salterton, Devon, England is a favourite haunt for most locals. The pine trees cut through the horizontals in this most gorgeous of places. Budleigh Beach is steeply shelving with Atlantic rollers crashing on the rounded pebbles. Nice for a swim, but very chilly! This print combined 2 techniques, using 2 perspex plates. 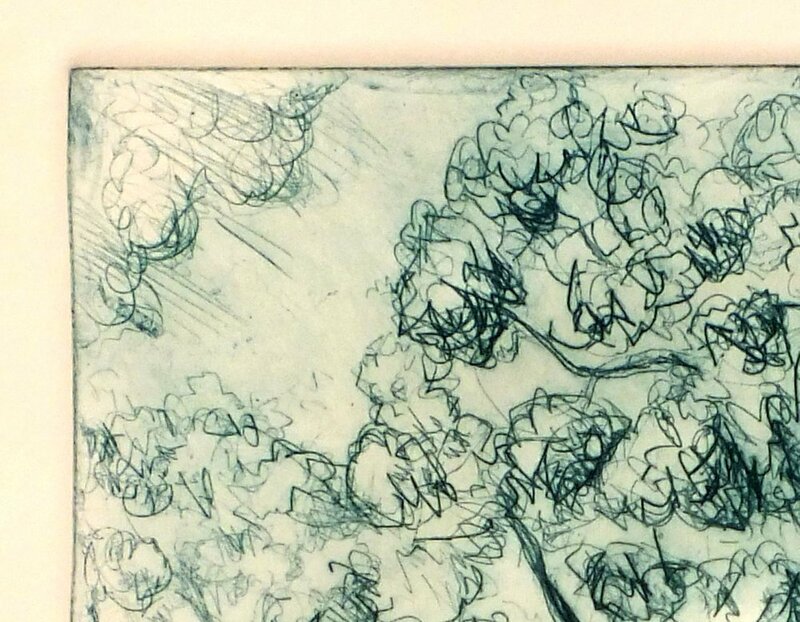 I scratched into one of the perspex plates with a sharp point to create the drawing. I inked up the etched plate ran it through the intaglio press for the first impression and then inked up the 2nd plate with relief ink to give the colour and ran the print through the press again. Summer Moon is an abstract image inspired by my travels to The Philippines. This is a variable limited edition one half of the prints are printed in Mint Green and the other half in Rust. Signed and titled in pencil, the prints are #1 of 9 and #6 of 9. Topsham is on the River Exe, downstream from Exeter and near the famous Exeter Ship Canal. The name Topsham probably derives from 'Topp', who was an Anglo-Saxon landowner. Another gorgeous place to visit in Devon for a cuppa! I etched a perspex plate for the drawing and used a blank perspex plate for the colour. 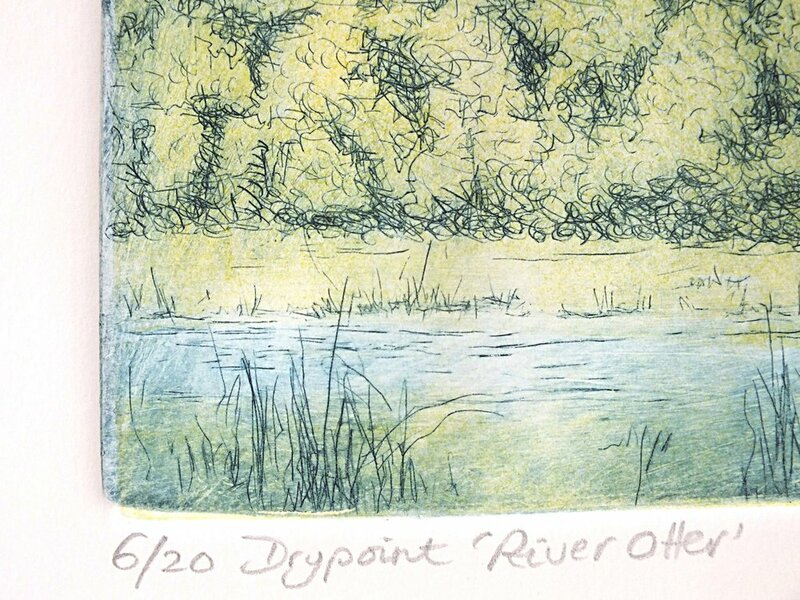 These are monoprints because each time I ink up the colour plate it is different. Topsham #3 is printed on 'Snowdon' quality cartridge. I etched a perspex plate for the drawing and used a blank perspex plate for the colour. These are monoprints because each time I ink up the colour plate it is different. Topsham #4 is printed on 'Snowdon' quality cartridge. I etched a perspex plate for the drawing and used a blank perspex plate for the colour. 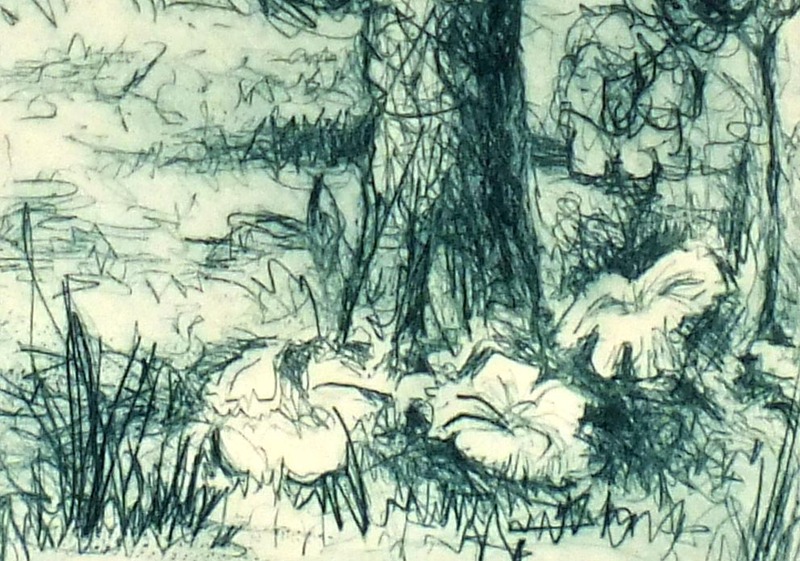 These are monoprints because each time I ink up the colour plate it is different. Topsham #5 is printed on 'Snowdon' quality cartridge. This print is a one-off and is only available UNFRAMED, but it does come with the mount. 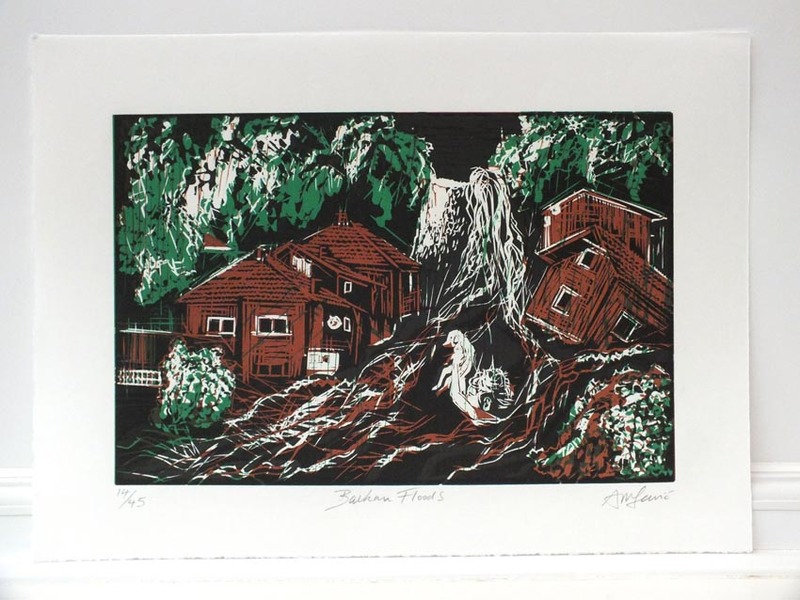 This original linocut print depicts the terrible floods that occurred in the Balkans in 2014. Over 80 people lost their lives and much property was destroyed. This image of the boy saving a puppy from the deluge was taken from a photo that went viral online. I don't know the photographer or what happened to the boy. 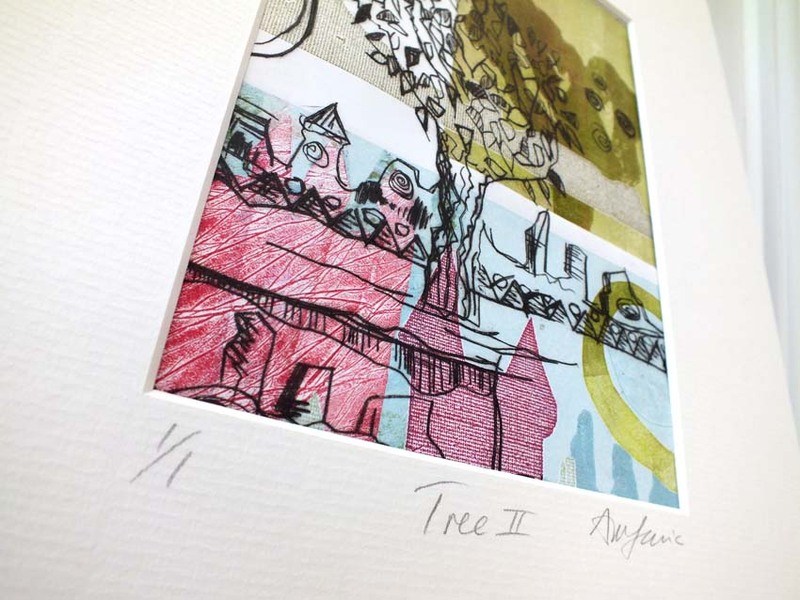 This print is one from a box-set called the 'Exeter Portfolio' containing prints created by printmakers from Double Elephant Print Workshop and by 4 contemporary artists commissioned by the Double Elephant.